Quite a few of you are sending me messages with information and links to stolen patterns and/or translated patterns that give no credit to the designer, in this case to me, and I appreciate that very much. I don't publish those comments because that would just send traffic to the offending sites. But I do report the sites when I can, however, some sites are untouchable due to location or site ownership. I just wanted you to know that even though I don't reply to you or publish your comment that I appreciate your love and concern. To you who take patterns and photos without permission, stop doing that! I am a reasonable person to deal with. I work hard at making these patterns for all to enjoy, and if one of my patterns gets translated then yahooo, I'll send people to those translations when I can. But I don't feel so happy about it when you steal my pattern, remove my website stamp from my photos and post it on your site with no credit or mention of my website at all. That is called theft and that makes you a thief. Don't be a thief, there's no need to steal anything. Leave my stamp on my photos and provide a link back to the original pattern you are translating and mention my website. And do this in your introduction and not in microscopic print somewhere at the bottom. That just means you'd rather not mention me and you just want to steal from me. Don't do that either, that's so wrong! Would you like me to come to your site and take all your work, all your photos, remove your name from your photos and post it all here. And somewhere near the bottom in fine print mention your name.. just your name? I don't think that would be nice of me at all, you'd probably be upset about that, right? In the future when others come here and ask if I have the translation in Spanish, German, Japanese.. or any other language, what would you like me to tell them, just your first and last name? Or should I provide a link to your translation? What do you think would be the best way to send people to you? Think about that. Provide a visible link back to the original and say where you got the original in your introduction. Use one photo only. That's all I'm asking! Be kind to me as I've been kind to you. Let's make sharing something awesome for both of us and the public. Good to tell this to the world. Their are to many thiefs in the pattern world. It is so easy to give the credits to the designer who put all the effort to design and write down the pattern. Why are they taking the patterns of others and give it away as their own pattern? Who want credits for the work of others. It is so unfair. The same is going on in the world of the pattern you can buy. One is buying a pattern and then gives it away for free on their facebook or in a facebookgroup. Not telling who the designer and ownerof the pattern is, not telling that it is not a pattern for free. I love your designs. I respect your work. Hopefully hereafter all users of your wonderful patterns will give all the credits to you. I don't understand why they refuse to credit the original designer. These people that take patterns are really just hurting themselves in the long run. Nobody likes a thief for certain. But all could be different if they just say the truth! If I can turn around one person and get them to stop stealing then I would be so happy for that! Have a wonderful day and thanks for the kind words, I really appreciate it. Hi Sharon! I'm here visiting your site (I just found it) and I just saw this post. I agree with you a lot!!! I love your patterns and I wanted to translate some of them into Portuguese (Brazil) but FOR SURE will give you credit and I will put your link (website and youtube) in my blog. I believe in Cause and Consequence and everything that I do I try to be very honest! I think doing it we help each other!!! So thank you and if you want to talk to me please visit my blog: artlocraftsmiami.blogspot.com I'll let you know if or when I post one translation! Thank you so much! I love your patterns and would like, with your permission, translate them into Danish. They will be posted on my Facebook page with links to your page and videos. Yes Alice, that will be fine. Thank you very much for asking! Honor to whom honor is due. 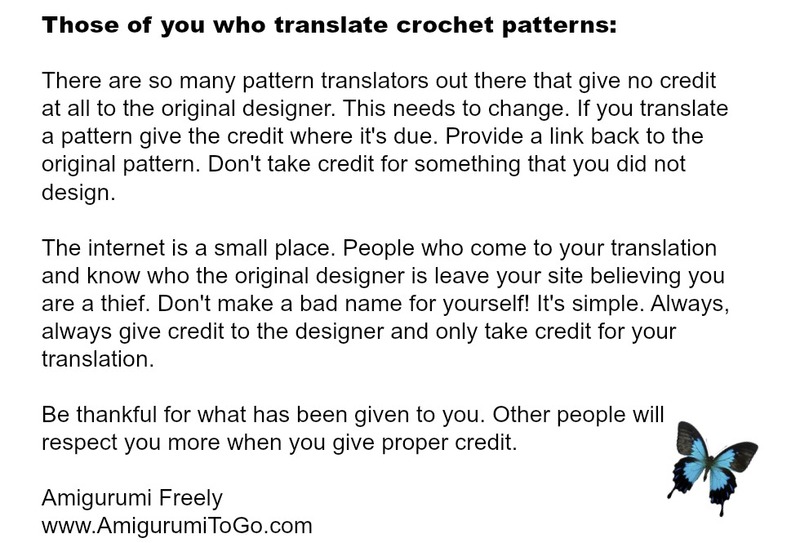 To translate a pattern without giving credit to the designer is a no-go. Even translating without asking first is wrong. I suppose most of the people who give their patterns for free are happy if their design is appreciated and can go round the world in many languages - as long as it stays clear that it is their design. At the moment I do the German translation of Annamaire Esterhuizens "Queen Mandala Cal" pattern. Me and all of the other translators (Dutch, Danish, Swedish) are always in contact with her, and of course we all follow HER rules about where to post it or not. In return, she asks us all to mention us as the translators. This is how it should be done. And those who want or need the money from selling their patterns even have a pecuniary loss. In fact I came here for another reason, when I read translations, I have a friend who doesn't speak English, so I thought of either send her the Original link and just explain what the shortcuts mean or take the time to translate the pattern and send you the translation as well, so you could use it. After reading above text, I will first ask you, if you have a German Version of the Dress me Bunny already and if not, if you would like one? And I appreciate everything you said too, thank you for that. I think this post is actually helping. I believe some people are just scared I'll say no and go and translate without permission and try to erase me all together. But they eventual get found and someone always messages me to tell me. Anyway, I'm so happy of your message, it was a great way to start my day, thank you! I just discovered your website and love it. It's so disappointing that others have no integrity. I am so impressed with your work and great YouTube videos. How someone could not acknowledge your talent is unbelievable. It's not so much acknowledging talent or skill but instead credit the pattern meaning where it came from. There are people who come to free websites like mine to take patterns, translate them and then display them on their own websites with no mention of where they got the pattern from. They display the pattern as if it was their own design. It's another form of theft. Many designers do not allow their patterns to be translated but I do, I only ask that the translator provide a link back to the original and say who designed the pattern. That's what I meant by credit. I appreciate your comment, thanks again for taking the time to leave such kind words, I appreciate that! Hello from Bangkok, Thailand / Thank you so much for your kind. :) They all so cute!. did you get my message last week? Debby contacted you already to ask you, if you would agree her to translate your patterns in German and in return she would be sharing them in her group, of course mentioning you as the designer and keeping respect to your work. It would be great if your patterns would be available in German. Hi Bianca, please forgive me for not replying sooner. I have been so busy and I wanted to answer the best way I could. 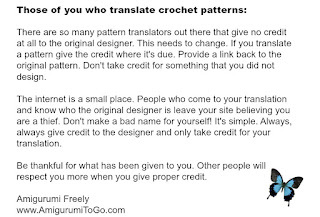 I saw her blog of translations and it's wonderful that they have been translated, however, a translation sitting on another person's blog should clearly state where the original pattern came from, crediting the designer for the original. I don't want to cause any hard feelings as she does link back to the original at the very bottom of her translations and that's a step above most. But there should be something mentioning the designer at the top, especially for patterns like mine that provide photos, and many times a video that helps put the amigurumi together. Many people wouldn't know to go looking at the bottom of the page for a link. Again, thank you so very much. I appreciate that you asked! To be honest I didn't know this detail and I think the same way as you, the Designer should be credited at the very top. I sure appreciate your understanding! Thank you for that. I hope that one day all bloggers will change the way they translate and share. It's just not for credit, it's for the viewer to find the original so they can see the photos and videos that would be helpful to them when making the pattern. Lots of love from Canada! Thank you Bianca! I just submitted the removal form, those posts will be gone soon. Again, I really appreciate that. I deleted your other comment.